Nick Young and his wife Helen are following the 1943 escape route taken by his father, Major Leslie Young, from Fontanellato Camp in northern Italy to Anzio, south of Rome. They are now on the third and final leg of their 350-mile journey. My father arrived in the small village of Corvaro, in the foothills of the Abruzzi mountains about sixty miles east of Rome, in November 1943. He and his fellow escaper, New Zealander Charlie Gatenby, begged shelter from the de Michelis family, and bedded down in the basement with the family horse, intending to be up and away early the next morning. But Dad awoke with a raging temperature and, within a day or so, had been diagnosed with pneumonia. His hostess, Bernadina de Michelis, insisted that he stay put until he recovered, and the two escapers were moved to a small nearby barn. Within a few days, the first snows of winter began to fall, and the men realised that they would be unable to make further progress south towards the Allied lines for some time to come. With a German garrison less than 100 yards from the de Michelis property, it was clearly impossible for the escapers to stay where they were, so Bernadina’s husband Peppino led them up into the hills, to a small stone shepherd’s hut in the nearby “Valley of the Bandits”. Here they stayed as the snow fell, through Christmas and into the New Year, sharing their tumbledown shelter with three other escapers who had hunkered down in the area for the winter. As they whiled away the days chopping wood for the fire and playing cards, they met up with two young Jewish partisans from Rome, Eugenio Elfer (25) and his sister Silvia (19). They had come to Corvaro with their parents to escape German persecution of Jews in the capital. These two, and Silvia’s admirer, a slightly mysterious character called Count Carlo Tevini, offered to guide the escapers through to the Allied lines south of Naples, as soon as the snows had abated and it was safe to go. 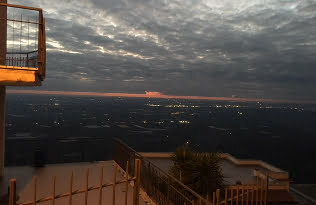 Then, in late January, came the exciting news that the Americans and the British had landed at Anzio, twenty miles south of Rome, and only a few days march from Corvaro, across the 6,000 foot peaks of the Simbruini mountains. 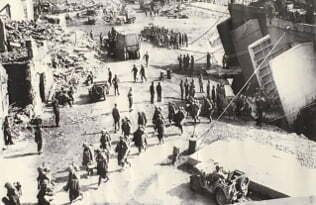 There were hurried meetings with the local partisans, and the decision was taken to head south without delay, in the hope of getting to Anzio and reaching the Allied lines before the Germans could flood the area with troops to fight off the invading forces. After a hurried goodbye to the de Michelis family, Charlie and Dad packed up the shepherd’s hut and set off with the Elfers and Tevini on 28th January 1944, in several feet of snow, for nearby Rosciolo. Dad was hampered by tummy troubles, necessitating frequent stops in the freezing cold. But the sun was shining for them, as it was for us, as we drove into Rosciolo, perched on a hill above the Porclaneta valley. We stopped in the tiny main square and poked around the silent narrow streets, watched curiously by the few elderly local people not out working or busy at home. The “Church of the Abruzzi” with its wonderful frescoes, visited by the last Pope, was open for cleaning so we slipped inside. Back in the car, we returned to the wide valley floor. 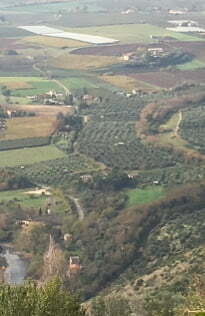 The roads were busy now, with traffic between l’Aquila, Avezzano and Rome. In 1944, these roads would have been jammed with German convoys, rushing troops towards the invasion beaches at Anzio. To reduce the danger of discovery, Dad and the others marched by night, split into two groups, scurrying across the roads when there was a gap in the traffic, heading south for the town of Tagliacozzo, 3,000 feet up in the mountains. 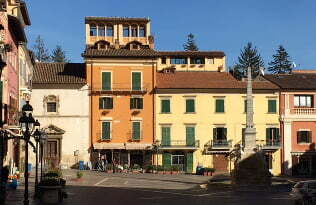 In the crisp late-morning air, we tramped around the rather baroque town square, half expecting a Verdi aria to peal out from an upstairs window. It was Monday, so restaurants were closed, but we found what looked like a small log cabin tucked away in a corner, where a grizzled cook grilled slices of lamb on an ancient rack in front of the log fire, and his son served thick, local red wine still chill from the cellar. Just the ticket! 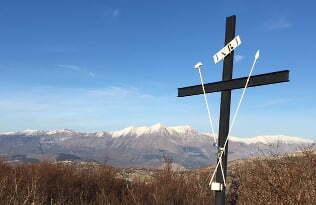 Leaving Tagliacozzo to cross the Simbruini mountains, we started badly. Satnav took us round in circles several times, and Google maps did much the same, only the circles were bigger. We nearly left them to fight it out alone but eventually, ignoring their shrill choruses of “Turn around when possible”, we pressed on up an unlikely-looking lane along the flanks of Monte Autore (6,000 feet), and soon found ourselves on a broken, icy track in the middle of a ghostly landscape of gaunt beech forest, and grassy clearings scattered with small rocks and notices to “beware of the wolves”. For mile upon mile, we inched slowly forward, as the sun began to set, towards Vallepietra – the Valley of the Stones. It was an awe-inspiring journey, and we stopped several times, aghast at the thought of what it must have been like doing it on foot, in several feet of snow, and in inadequate clothing, with the constant fear of running into a German patrol. It took them two full days, with a night in between huddled in a cave somewhere near the top of the pass, before they stumbled down into the village of Vallepietra, clinging to a cliff edge at 3,000 feet. It was almost dark as we parked the car at the foot of a narrow lane leading up between a huddle of houses to the tiny Piazza Marconi. Even Heli and I, in our comfortable car and warm coats, felt relieved to have reached civilisation again. We found an immaculate little village, buttoned up all-tight and snug for the winter, piles of logs ready for the fire and with fresh supplies of beer and grappa being loaded into the cosy cafe. 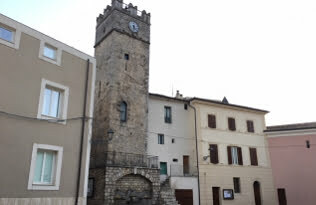 On the piazza, an ancient bell tolled the hour from a medieval tower, as it had done for centuries, and lights appeared magically in the windows overlooking the square as evening approached and the men came in from the fields for supper. It was just timeless and completely captivating. For Dad and his friends, it must have seemed like heaven. We drove back to our hotel in Frascati, quiet and thoughtful. My father was as impressed with Vallepietra as we were, seventy years later. “Excellent village – good bed,” he noted in his diary on Monday 31st January 1944, and he was relieved to be given some medicine for his stomach as well. But his hopes of a sound night’s sleep were dashed when he was woken after midnight with the news that the Germans were searching the village for escapers, and he and the others had to leave their beds in a rush and hide away from the house where they were staying. Their start the next day was delayed as a result, but they made good progress nevertheless down the long, rocky mountain pass towards the large town of Piglio, which lies across the head of a deep ravine. Late in the afternoon, they spotted a German patrol coming towards them up the footpath: it was too late to take evading action, so they carried on, trying to look and sound as Italian as possible, and the patrol passed them by without a challenge. Before they got to Piglio itself, high on a hillside overlooking the town, they stopped at the Convent of San Lorenzo, where they were taken in by the monks and given food and a bed for the night. For Dad, the convent was perhaps a mixed blessing as he “thought the Father would never stop talking”! Their sleep was disturbed by the sound of loud gunfire from the beaches at Anzio, where they were heading. We called at the convent this morning, its yellow ochre walls warm in the sunshine, and met one of the three Franciscan monks who still live there. We showed him our thank-you letter, and for a moment he seemed quite overcome. He showed us the domed echoing chapel, and the tiny cave in the grounds where an ancient monk once lived. Then he left us to look around, and I sat quietly in the church and lit candles that burnt brightly in the shadows. Later, we talked with a visiting nun from North Dakota, who listened gently to our story and offered a medallion and a prayer. After a solid breakfast, Dad and his companions made an early start, moving stealthily downhill towards the valley floor at bustling Anagni, but stopping short and resting for the night in a shepherd’s hut, where they were disturbed again by heavy artillery fire from the beachhead. By now, they were only a dozen miles from the front line, in a hilly rural area which must have been bristling with soldiers as the German commander Kesselring rushed to build up his defences after the surprise landings at Anzio. 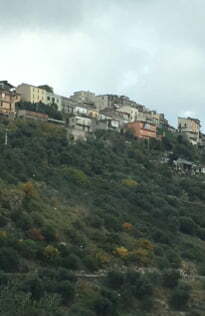 They had a main road to cross, and a railway line, before settling down in another shepherd’s hut near the substantial town of Segni, sprawled across a bleak hilltop. 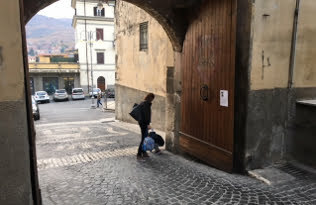 Nearing the end of our own long odyssey, we felt in a playful mood, and pinned our thank-you letter to the massive wooden gates at the entrance to the old part of town. Then we drove on west in the gathering dusk towards a red-smeared sky above the beach at Anzio, and the drab town of Norma, settled on a bluff above the battlefield that Dad, Charlie, the two young Elfers and Tevini had to cross if they were to reach safety. Today, we drove two hundred miles north from Rome to visit a family who live near Florence. It was a long way off our route – and it was all because of a fifteen-year-old girl and her meeting with a very wet and hungry Englishman. Just a week before we set off on the final leg of our journey, I got an email from Daniela Bergamaschi, who told me that her mother Angiolina, who had been visiting her husband’s grave near Verghereto in the Alpe di Serra with Daniela’s sister Flaviana, had been chatting with local friends and they had told her about one of our ‘thank-you letters’, which they had found pinned to a tree near their home. Angiolina insisted on going to have a look at the notice, and instantly recognised the photo of my father as the young man who had appeared at her parents’ home in October 1943, asking for food and shelter. She described his wet and dishevelled appearance, how her parents had taken him in, dried his clothes and fed him, and then offered him a bed for the night. The young man had declined the bed, wanting to make as little trouble as possible, and in order perhaps to be able to make a quick escape if necessary, and slept instead in a chair by the fire. The next morning, after a breakfast of bread and warm milk, and a flurry of goodbye hugs, Pietro the head of the household, showed him the best path to take for the next stage of his journey. I must confess that, when I first read Daniela’s charming email, I had some reservations. My father was not travelling alone, but with the RAF pilot Reg Dickinson and their new Kiwi friend Charlie Gatenby. And how likely was it anyway that her mother would recognise the face of the young man who spent a night in her home 74 years previously? But then I looked again at the diary. On 22nd October 1943, the three men were crossing a main road near Verghereto, a village on the main road near Bagna di Romano. It was busy with troop convoys and local traffic, and they decided to split up and dash across, every man for himself, whenever it was safe to do so. Somehow, in their anxiety to avoid being caught, they became separated, and my father found himself alone. He waited awhile, and eventually decided to trudge on by himself. With darkness falling, there was still no sign of the other two, and he needed shelter. Reg had the map, so he had no idea where he was, but he saw an isolated farmhouse on the hillside ahead and decided to take a risk and knock on the door. Could it be that the door he chose was at Madioce, the home of Angiolina, then a young girl of fifteen and her eight brothers and sisters, the children of Pietro and Benilde Bragagni? 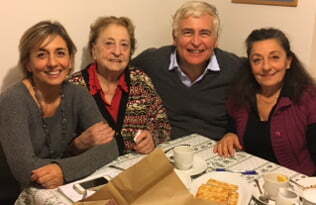 Having spent the afternoon with Angiolina and her two daughters, still bright as a button in her 89th year, I have no doubt that it was. Angiolina’s father Pietro was a sharecropper, paying rent to his landlord in the form of a large portion of the crop. The family had to live on whatever was left over. It was a hard life, and they often went without. During the Nazi occupation, things became much worse. Soldiers, and local Fascist supporters, would come to the house and just take what they wanted. Benilde would keep the girls out of the way, just in case. One day German soldiers threatened to take Pietro if he did not give them more food, but Angiolina’s future husband Sisto convinced them that he was mad and they went away. 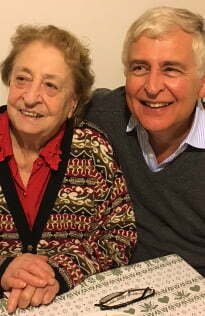 I sat next to Angiolina at the kitchen table while she told her story, just as my father had done at Madioce all those years ago. Every now and again, she put her hand on my arm and peered into my face, as if to check that I was real, and not some ghost from the past – which, in a way, I was. It was such a happy afternoon – and all thanks to a fifteen-year-old girl, a wet and hungry Englishman, and a letter pinned to a tree! As my father and Charlie gazed down across the wide plain of the Pontine Marshes towards Anzio from the cliff-top at Norma on 6th February 1944, they must have realised with a sense of deep foreboding what a hornets’ nest they were about to step into. Hoping to get behind the southernmost German defensive lines (of which Monte Cassino was a part), the 370-ship invasion fleet for the landings at Anzio/Nettuno (Operation Shingle) anchored silently off the beaches late on 22 January and, at 2am the next day, the first landing craft headed ashore as a massive bombardment from the Allied warships out at sea crashed into the town.. The Germans were taken completely by surprise and, by nightfall, there were more than 36,000 Allied troops on the beach and heading inland. But within a day or so the defenders had rushed over 40,000 troops into place, and a constant bombardment of the Allies’ beachhead had begun. The fighting from then on was nightmarish, in freezing cold weather, and with constant sleet and snow churning the earth to seas of mud. The expansion of the beachhead and eventual breakout alone became a bitter and bruising struggle during which over 7,000 Allied soldiers died, and 36,000 were wounded or missing. More than 300,000 troops on both sides fought it out, with almost unparalleled intensity, over a mere sixteen miles of front, under constant bombardment from sea and air on the Allied side, and from the heights of the Alban Hills just to the east of Rome by the Germans. It was to be three months before the capital, only twenty miles away, could be liberated. There is little sign of the wartime devastation of the town today. The swish villas along the elegantly curving seafront have all been rebuilt, and only the grim black and white photos of rubble piles and blackened buildings crammed hugger-mugger into the tiny beachhead museum give any sense at all of what it must have been like. That, and the silent white crosses, thousands and thousands of them, drawn up in tidy ranks on the perfect lawns of the American Sicily-Rome War Cemetery at Nettuno, or the autumn-blown yellow roses and wistful-sad epitaphs carved upon the simple headstones in the British beachhead cemetery just outside Anzio. Dad and Charlie waited nervously for nightfall in Norma with their three partisan guides. Perched on a rocky clifftop high above the chequerboard landscape of the Pontine marshes, they spent the day studying a sketch map of the German positions given them by a local partisan, and working out a route to the American line around the narrow beachhead at Nettuno. Heli and I sat in a cafe in Norma, looking down on the same scene. The town behind seemed a busy, slightly run-down sort of a place, its only claims to fame its position high above the plain, a pretty garden at the base of the rock, and a nearby chocolate factory. 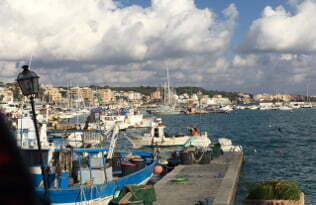 The coast at Anzio was just visible in the distance, a splash of glitter at the far edge of the marsh. The marshes were drained by Mussolini in the 1930s, as part of a massive job-creation and poverty-alleviation scheme which brought tens of thousands of jobless men and women, many of them veterans of the Great War, down from northern Italy to set up in new, small farms on the former marshland. 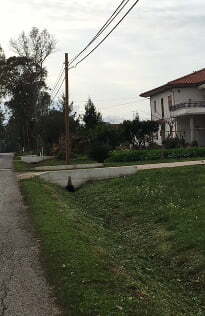 The area is criss-crossed by a network of canals and straight narrow roads lined by ditches that border the small homesteads called “podere”, each (originally) with its own identifying number painted on the side. Through the middle running east to west is the broad “Mussolini Canal”, whilst north to south runs the Via Appia from Rome to Naples. In February 1944, the whole area was alive with German soldiers, desperate to push the Allies back into the sea. Overhead, artillery fire rained down on the beaches from the Alban Hills south-east of Rome – fire that was returned with interest from the warships out at sea. The five escapers set out at dusk on 6thFebruary, threading their way down the thousand-foot cliff from Norma and then off across the plain. The moon had risen, increasing the danger of them being seen, silhouetted against the snowy landscape, so they were forced to make what progress they could by crawling through snow-filled ditches and scampering across roads in ones and twos, ears straining for the sound of a German patrol against the constant boom of distant guns. Crossing the Appian Way, with the canal half a mile away to their right, they suddenly found themselves in a German minefield. Charlie had some experience of laying mines, so he led the group through on hands and knees, each holding on to the ankle of the one in front. It was bitterly cold and, after several hours of painfully slow, fear-filled progress, they still had three miles to go to the American line. After a whispered conference, their confidence ebbing away, they decided fatefully that their only hope lay in making a break for it along the roads themselves. No sooner had they risen to their feet than they were spotted by a German patrol. A machine gun sent a hail of bullets down the road towards them. In front, Eugenio and Carlo Tevini went down, whilst Dad hurled himself into a ditch. Charlie, with Silvia, did the same on the other side of the road. When eventually the firing ceased, Charlie waited in the silence, then crawled slowly forward along the ditch to where a body lay motionless. He found Tevini, bleeding heavily from bullet wounds in the chest and clearly dead or dying; of Eugenio there was no sign. Silvia wanted to stay with Tevini, and to look for her brother, but Dad and Charlie were adamant that that would mean certain death, and that her best course was to carry on with them, to try to reach the American lines. They decided to wait for the moon to set, so there would be less chance of being seen but, as soon as it did, a new bombardment of the beaches opened up. They waited again, and then eventually began to crawl painfully forward. Minutes passed like days as they crept along. Twice they were fired on, twice they lay motionless in the ditch until they judged it was safe to move again. Each time they paused, exhausted, they discussed whether they should give themselves up. A mound appeared ahead of them, probably a spoil heap from the original digging out of the canal. They clambered up, to get a view of what lay beyond, and a sense of how far they had to go. My father’s long walk from Fontanellato was over, but in tragic circumstances, with Eugenio missing, Tevini apparently dead, and Silvia terribly injured. Tomorrow – the final day. Silvia was taken to the American Field Hospital for emergency surgery, but she never recovered consciousness, and died the next morning. 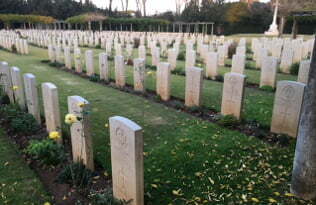 My father’s first duty as a soldier again, in Anzio, was to organise her funeral the next day. Eugenio too died, hit by the bullets fired by the German patrol on the Pontine marsh. His body was given a rough, temporary burial in the ditch where he fell, and there it might have stayed for years, had not his redoubtable mother Elisa instituted a search for her son after the war was over. Hearing a report that a body had been buried in a ditch at about the same time that her son had disappeared, she applied successfully for the body to be exhumed and, with the help of, amongst other things, evidence from my father and Charlie as to the documents he was carrying, she was able to prove that the body was indeed that of her son. The bodies of both her children were then brought back to Rome, to be buried with her husband – who had died almost immediately upon hearing that his children had been killed. We wanted to try and find the spot where Eugenio died, and indeed it was fairly easy to follow the approximate route the escapers must have taken because the basic geography of the marsh has changed little over the years. We also knew that his body had initially been buried near “Podere 355 at the village of Borgo Podgora”. In we went. With a mix of English, Italian and much waving of arms, we explained our quest. “Momento”, said the lady behind the counter, and dashed upstairs. We hung about, not quite sure what was happening. Eventually she returned, with an elderly man who stood looking at us expectantly. “Sono Benito, Podere 355”, he said. Minutes later we were at the farm, driven by his nephew Giampaolo and his English-speaking daughter Giulia. Benito was three when the Allies landed at Anzio, and knew nothing of the discovery of Eugenio’s body in the ditch. “That would have been my father Umberto who found it,” he said. “But I have an elder sister, I will ask her. 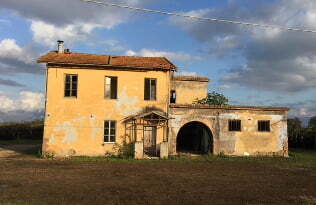 My father was amongst the first tenants to occupy one of the podere, and he was so grateful to Mussolini that he named all his children after members of Il Duce’s family,” Benito said, with a wry grin. We drove away, pleased of course to have found Podere 355 and, indeed, to have made some delightful new friends. But we were overwhelmed too by thoughts of what had happened to Eugenio and his sister Silvia, all those years ago – and of the effect that their deaths must have had on my father for the rest of his life. And there was one final mystery. In the summer of 1944, working with the New Zealand Army in Rome, Charlie was passing the Spanish Steps one day when he was astonished to see, walking towards him, none other than Carlo Tevini, resplendent in an Italian Army uniform. He told Charlie how he had been picked up by the Germans after the shooting and taken to their field hospital, where he had eventually recovered from his life-threatening injuries. They had interrogated him for some weeks but then, he said, when Rome was liberated by the Allies in June 1944, he was released. Charlie kept in touch with Tevini for a while after the War, and received news of his marriage and the birth of a son. But then he heard no more, and I have been unable so far to find a link to the family. Did he leave behind an account of his feelings for Silvia Elfer, his relationship with the Elfer family and the partisans, and his miraculous escape? We may never know. 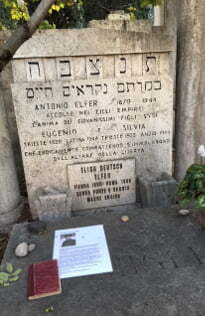 We spent our last morning in Rome beside the grave of the Elfer family, in the Jewish section of the city’s huge cemetery at Verano. 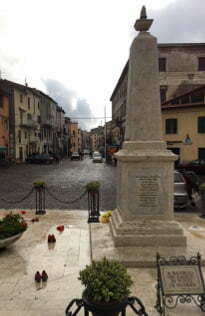 The headstone records the death of Antonio, the father, and of the heroic sacrifice made by his two children. Elisa, “una donna forte e saggia, madre heroica” (“Brave and wise as a woman, heroic as a mother”)was buried there in 1995 after her own death, at the great age of 105, having lived alone with her memories for fifty-four years after the deaths of her loved ones.